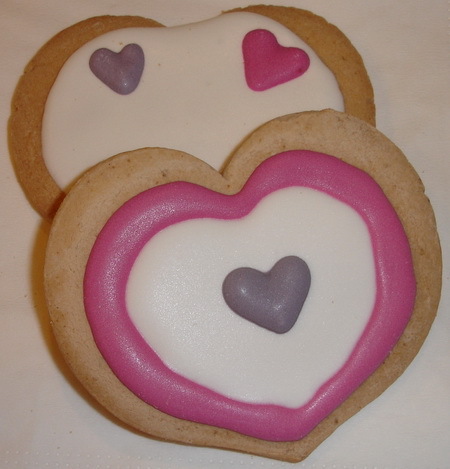 These Valentine Biscuits (cookies) caught my eye as I was walking around the supermarket the other day. Then as usually happens, once my eyes have been alerted to something, that is all I can see where ever I look. The Valentine’s Day marketing machine was working over time in the shopping centre and even at home I couldn’t escape seeing hearts and more hearts. 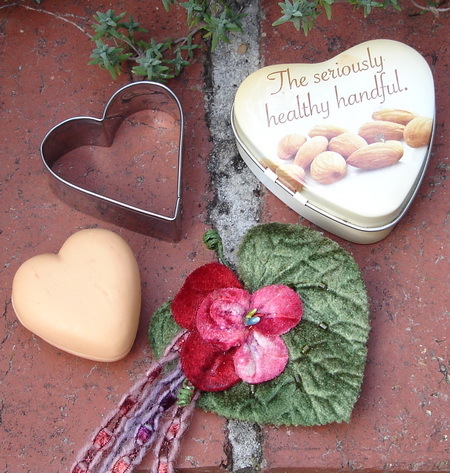 Judy’s heart blocks are a great stash buster …. 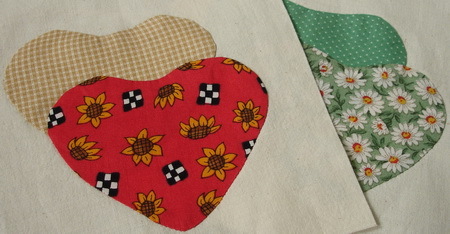 you can use up a wide variety of fabrics to create a “new” pieced fabric to use for the applique hearts. 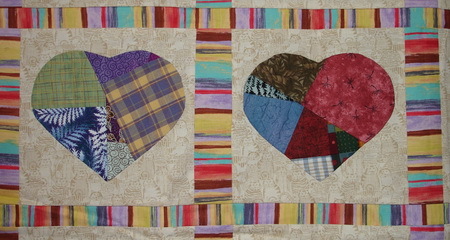 Heart blocks are the “go to” block when a group quilt is made as a gift quilt for a friend (or stranger) in need of simple hug. 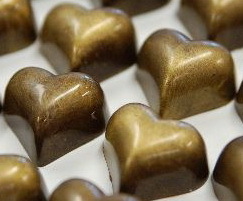 They are the perfect way to say “we are thinking of you in your time of need/sorrow/loss”. 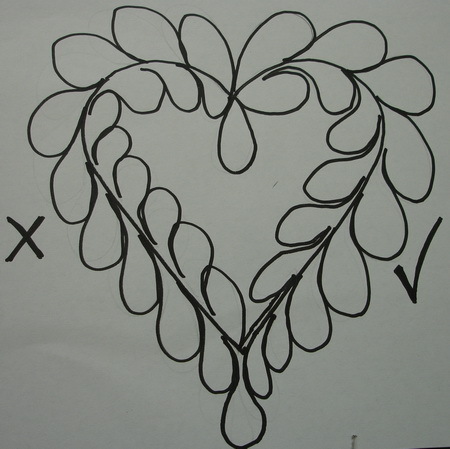 Being a symmetrical shape, the heart is not an easy shape to draw so it is handy to have a template to trace. 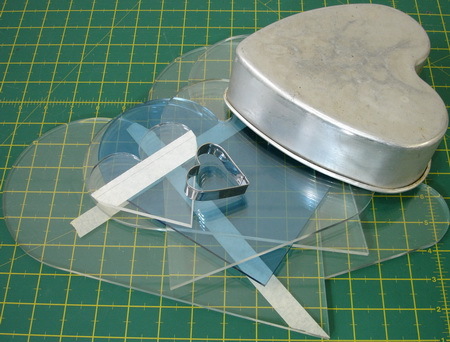 You can purchase lots of plastic shapes but don’t forget to look in the kitchen cupboard … the biscuit cutter & cake tin cake be very useful. My favourite little biscuit cutter is particularly useful as the heart is small enough to be used to draw flower petals and heart wreaths. If you don’t have a template shape handy, you can make one by folding a piece of paper in half and cutting the edge, parallel to fold, into a question mark shape. Open out the paper and re-shape the heart to suit. Now, back to using a template to create patterns. 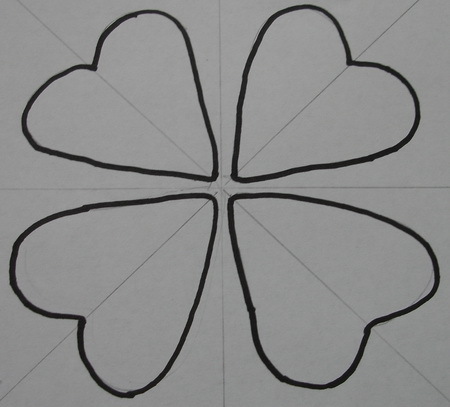 By adding a second round of heart shapes to the block design you can make a flower shape. 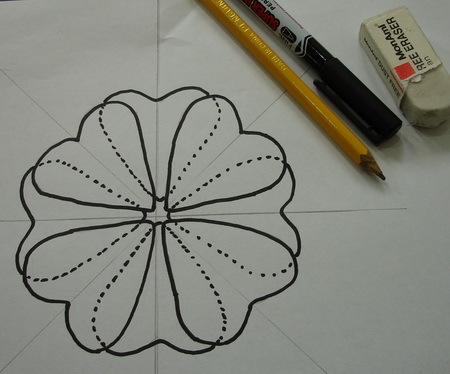 This shape can be used for applique or embroidery with the petals picked out in layers. 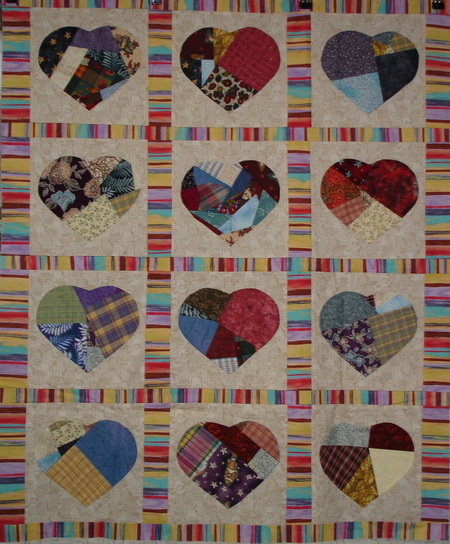 When it comes to quilting, I can happily freehand a “hanging heart” background meander but I have to think very carefully about the quilting directions when stitching a more formal feathered heart. I have been known to stitch the feathers in the wrong direction on a feathered heart. 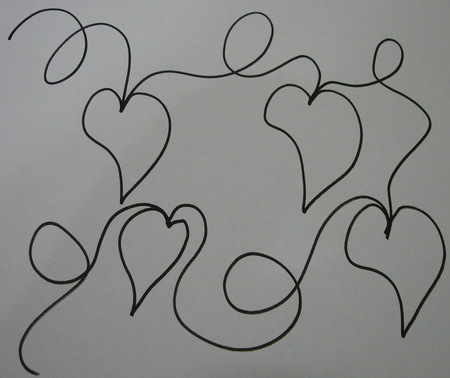 The trick is to have the little feather heart shapes all travelling out from a centre point to the left and to the right with the tail running parallel, back up the spine, towards the top of the heart. I always have to do some practice drawings before stitching. Enough rambling, it is time for stitching I hear you say. 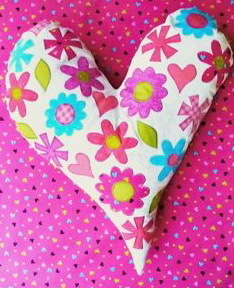 If you want to make a heart gift for someone special this month I think you will still have time to make up the Heart Cushion designed by Linda De Bono for the February 2011 Aurifil Designer program. Even though the 2011 Flickr competition has closed, the pattern is still available for your use to make up this delightful cushion.